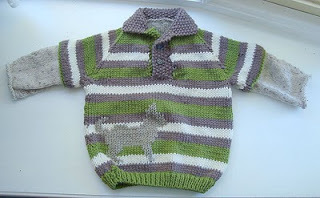 My friend Millard has designed a gorgeous kid's jumper, called Positive Chi (chi being short for chihuahua). 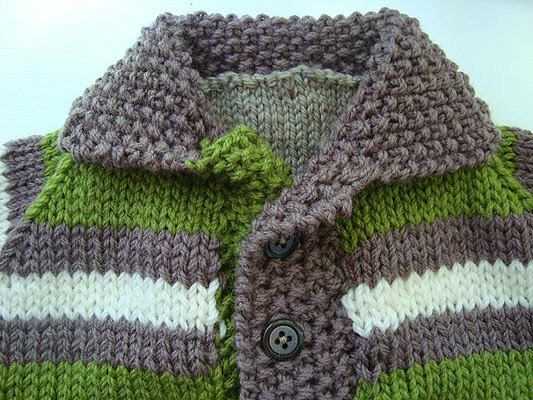 I decided to knit it for my nephew Tom's first birthday. Here's how it turned out! Here's Tom trying it on when it was about 3/4 done ... I made the Medium size, which should fit him well when we get to cooler weather next year. I haven't managed to get a pic of him wearing the finished jumper yet. ... and a chihuahua on the front. This was my first time doing duplicate stitch, and I must say I love it! 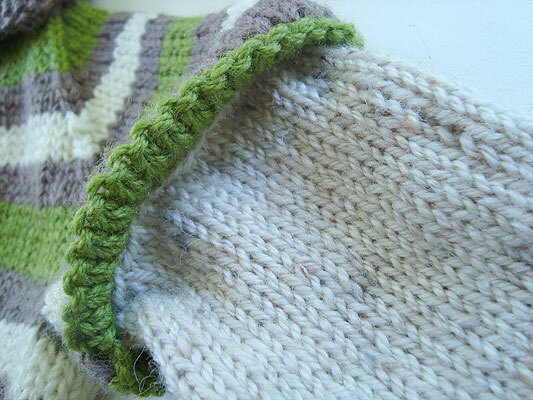 The sleeves have a nice neat line of decreases ... (slip 2 sts tog knitwise, knit 1, pass the 2 slipped stitches over). 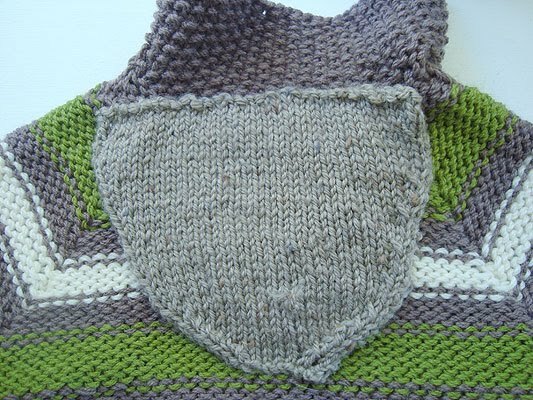 The collar and placket are in seed stitch. It has inset 'undershirt' sleeves, knit in 8 ply and sewn in. 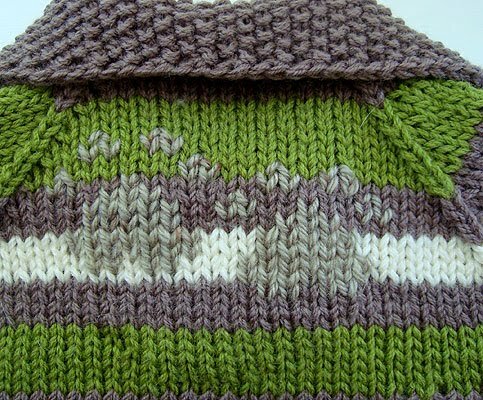 The main jumper is knit in 12 ply. I used Bendigo Classic (machine washable) 12 ply, in Guava, Java, and Magnolia. As a finishing touch there's this neck facing sewn in at the end - not essential, but a nice design feature. For those of you interested in the fine details, you can access my Ravelry project page here. And yes, I know I made a mistake in the stripe pattern. I meant that. Honest. I love it Denise - especially the shoulders! The colours are just perfect too. 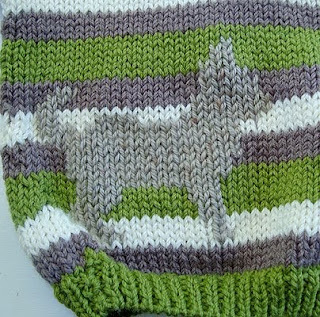 Now will that duplicate stitch chihuahua show up in other knitted items? The sweater is too cool for school! 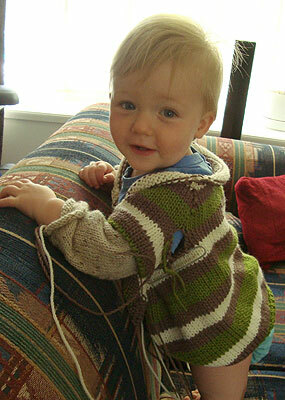 That is a very cool pattern for a little fella! Love the "undershirt" sleeves, what a great idea. And the colours you've chosen are fab! It's adorable! I like duplicate stitches,too. 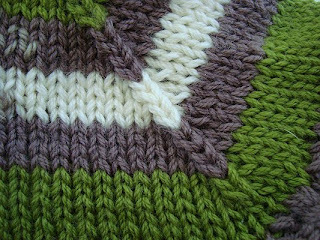 The look of stranded color knitting without all the ends. And Tom is such a cutie. What a smile. He is a very lucky nephew.